Gary C. Kelly, Chairman of the Board and Chief Executive Officer, stated, "We are very pleased to report another quarter of strong profits and margins, particularly considering the impact of the unprecedented natural disasters. As a result of Hurricanes Harvey and Irma and the earthquakes, we cancelled 5,000 flights which reduced revenues by approximately $100 million in third quarter 2017. Our People's efforts to provide humanitarian flights, supplies, and financial assistance to Coworkers, Customers, and the communities impacted were truly heroic. Our hearts continue to go out to those impacted. During the quarter, our Employees also managed the retirement of the remaining Boeing 737-300 (Classic) fleet and simultaneous introduction of the Boeing 737 MAX 8 into our fleet. With the launch of the MAX, we were excited to announce our intention to serve Hawaii, which is another exciting milestone for Southwest. I am grateful to our Employees for these significant accomplishments and their extraordinary efforts during these operational challenges." Net income of $503 million, diluted earnings per share of $.84, operating income of $834 million, and operating margin of 15.8 percent. Excluding special items, net income of $528 million, diluted earnings per share of $.88, operating income of $871 million, and operating margin of 16.5 percent. Third quarter operating cash flow of $996 million and third quarter free cash flow of $358 million. Returned $375 million to Shareholders through a combination of dividends and share repurchases. Return on invested capital (ROIC)2 for 12 months ended September 30, 2017, of 26.8 percent. The Company's third quarter 2017 total operating revenues increased 2.6 percent, year-over-year, to $5.3 billion, driven largely by third quarter record passenger revenues of $4.7 billion despite an approximate $100 million reduction as a result of the natural disasters. Third quarter 2017 passenger revenue yield decreased 0.9 percent, year-over-year, due to the competitive yield environment. Third quarter 2017 operating unit revenues (RASM) decreased 0.5 percent, year-over-year. Third quarter 2017 unit revenue results included headwinds of less than a point from the Company's new reservation system that is not expected to continue in fourth quarter 2017. The Company continues to expect the benefits from the new reservation system capabilities to produce incremental improvements in pre-tax results of approximately $200 million in 2018. Thus far in fourth quarter, overall revenue trends remain stable, and the Company is encouraged by the rebound in passenger booking trends in Houston and Florida. While the revenue yield environment remains competitive, passenger revenue yields thus far in October, on a year-over-year basis, have improved sequentially from August and September year-over-year trends, and travel demand remains solid. Based on these trends and current bookings, the Company expects fourth quarter 2017 RASM to increase in the range of up slightly to up 1.5 percent, as compared with fourth quarter 2016. Third quarter 2017 total operating expenses decreased 0.2 percent to $4.4 billion, or 3.2 percent on a unit basis, as compared with third quarter 2016. As expected, the Company recorded aircraft grounding and lease termination charges of $83 million (before profit-sharing and taxes) as a special item associated with the Classic fleet retirements during third quarter 2017. Third quarter 2016 included $356 million of accrued ratification bonuses (before profit-sharing and taxes) as a special item associated with tentative collective-bargaining agreements reached with multiple unionised work groups, as well as lease termination charges totalling $18 million as a special item. Excluding special items in both periods, total third quarter 2017 operating expenses increased 5.6 percent to $4.4 billion, or 2.5 percent on a unit basis, year-over-year. Third quarter 2017 economic fuel costs were $2.00 per gallon, including $.31 per gallon in unfavourable cash settlements from fuel derivative contracts, compared with $2.02 per gallon in third quarter 2016, which included $.56 per gallon in unfavourable cash settlements from fuel derivative contracts. Based on the Company's existing fuel derivative contracts and market prices as of October 20, 2017, fourth quarter 2017 economic fuel costs are estimated to be approximately $2.10 per gallon. As of October 20, 2017, the fair market value of the Company's fuel derivative contracts settling during fourth quarter 2017 was a net liability of approximately $129 million, and the fair market value of the hedge portfolio settling in 2018 and beyond was a net asset of approximately $126 million. Additional information regarding the Company's fuel derivative contracts is included in the accompanying tables. Excluding fuel and oil expense and special items in both periods, third quarter 2017 operating expenses increased 7.1 percent, as compared with third quarter 2016. Third quarter 2017 profitsharing expense was $127 million, as compared with $101 million for third quarter 2016. Excluding fuel and oil expense, special items, and profitsharing expense, third quarter 2017 operating expenses increased 6.5 percent, or 3.3 percent on a unit basis, year-over-year. The primary drivers of this year-over-year unit cost increase in third quarter 2017 were the impacts from the natural disasters and the significant snap-up in wage rates due to Flight Attendant and Pilot amended collective-bargaining agreements that became effective in fourth quarter 2016, partially offset by benefits from the Company's fleet modernization efforts. Based on current cost trends, the Company estimates fourth quarter 2017 unit costs, excluding fuel and oil expense, special items, and profit-sharing expense, to be in the range of flat to up 1.5 percent, year-over-year5. This continued sequential improvement in unit cost trends is aided by the retirement of the Classic fleet, the lapse of the step-up in wage rates from labour collective-bargaining agreements ratified in fourth quarter 2016, and the wind-down of temporary costs associated with the May 2017 implementation of the new reservation system. The Company's year-over-year estimate of fourth quarter 2017 unit costs, excluding fuel and oil expense, special items, and profit-sharing expense, is higher than previously expected due largely to a shift in advertising spend from third quarter 2017 to fourth quarter 2017 and incremental costs associated with technology investments including the Company's Extended Operations (ETOPS) authorisation in preparation for Hawaii service. Third quarter 2017 operating income was $834 million, compared with $695 million in third quarter 2016. Excluding special items, third quarter 2017 operating income was $871 million, compared with $972 million in third quarter 2016. Other expenses in third quarter 2017 were $43 million, compared with $77 million in third quarter 2016. The $34 million difference resulted primarily from $39 million in other losses recognised in third quarter 2017, compared with $64 million in third quarter 2016. In both periods, these losses included ineffectiveness and unrealised mark-to-market amounts associated with a portion of the Company's fuel hedging portfolio, which are special items. Excluding these special items, other losses were $35 million in third quarter 2017, compared with $33 million in third quarter 2016, primarily attributable to the premium costs associated with the Company's fuel derivative contracts. Fourth quarter 2017 premium costs related to fuel derivative contracts are currently estimated to be approximately $34 million, compared with $36 million in fourth quarter 2016. Net interest expense in third quarter 2017 was $4 million, compared with $13 million in third quarter 2016. Third quarter 2017 net income was $503 million, or $.84 per diluted share, compared with third quarter 2016 net income of $388 million, or $.62 per diluted share. Excluding special items, third quarter 2017 net income was $528 million, or $.88 per diluted share, compared with third quarter 2016 net income of $582 million, or $.93 per diluted share, and compared with First Call third quarter 2017 consensus estimate of $.87 per diluted share. As of September 30, 2017, the Company had approximately $3.0 billion in cash and short-term investments, and a fully available unsecured revolving credit line of $1 billion. During third quarter, Standard & Poor's upgraded the Company's investment grade credit ratings to "BBB+" from "BBB." Net cash provided by operations during third quarter 2017 was $996 million, capital expenditures were $638 million, and free cash flow was $358 million2. The Company repaid $106 million in debt and capital lease obligations during third quarter 2017, and expects to repay approximately $57 million in debt and capital lease obligations during fourth quarter 2017. During third quarter 2017, the Company returned $375 million to its Shareholders through the payment of $75 million in dividends and the repurchase of $300 million in common stock. The Company repurchased $300 million in common stock pursuant to an accelerated share repurchase (ASR) program launched during the quarter and received approximately 4.1 million shares, representing an estimated 75 percent of the shares expected to be repurchased under that ASR program. During third quarter 2017, the Company also received approximately 1.6 million shares, which remained pursuant to a $400 million second quarter 2017 ASR program, bringing the total shares repurchased under that ASR program to approximately 6.6 million. The Company has $1.7 billion remaining under its May 2017 share repurchase authorisation. For the nine months ended September 30, 2017, net cash provided by operations was approximately $3.4 billion, capital expenditures were approximately $1.6 billion, and free cash flow was a strong $1.8 billion2. This enabled the Company to return approximately $1.5 billion to Shareholders through the payment of $274 million in dividends and the repurchase of approximately $1.25 billion in common stock. The Company ended third quarter 2017 with 687 aircraft in its fleet. This reflects the third quarter 2017 delivery of six new Boeing 737-800s, six pre-owned Boeing 737-700s, and nine new Boeing 737 MAX 8 aircraft, as well as the retirement of the Boeing 737-300 Classic fleet, which was completed on September 29, 2017. The Company continues to expect to end 2017 with 707 aircraft and 2018 with 750 aircraft in its fleet. Additional information regarding the Company's aircraft delivery schedule is included in the accompanying tables. The Company currently expects its fourth quarter 2017 available seat miles to increase in the one to two percent range, compared with the same year-ago period. During third quarter 2017, the Company continued its investment in California by adding nearly 20 new nonstop routes, increasing frequency to 27 existing routes, and opening new international gateways, in each case beginning in 2018. The Company also recently announced plans to begin selling tickets in 2018 for service to Hawaii and announced its intention to launch an application process for Federal Aviation Administration authorisation for ETOPS. The Company continues to expect its 2018 available seat mile year-over-year growth to be less than 5.7 percent, with first half 2018 year-over-year growth in the range of three to four percent. 2017 Women's Choice Award® for America's Best in Travel. 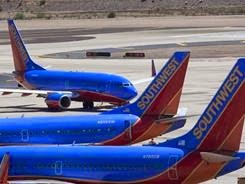 Southwest was selected by American women as the most recommended for: best overall customer service, best value, best frequent flyer/loyalty programs, and best in-flight service.